The alteration of the delicate balance between repolarizing and depolarizing ionic currents determines arrhythmic risk. In animal cardiomyopathic models and human heart failure, ion channel downregulation results in slow conduction and prolongation of the action potential duration (APD) that contributes to arrhythmic risk. Recently, it was discovered that human heart failure is associated with the activation of the endoplasmic reticulum unfolded protein response (UPR). The UPR promotes protein folding capacity by increasing UPR genes expression and translation and reduces the burden of endoplasmic reticulum (ER) protein by the enhancement of mRNA decay, inhibition of protein translation, and acceleration of protein degradation via the PERK and IRE1 branches. Although several cardiovascular diseases (such as myocardial infarction, ischemia/reperfusion, hypertension, and heart failure) have been associated with the activation of UPR, the signaling cascades of these branches have been investigated mainly in neural degeneration diseases. In a recent publication in Journal of Molecular and Cellular Cardiology, Dr. Man Liu and Professor Samuel C. Dudley Jr. from the Division of Cardiology at the University of Minnesota in collaboration with scientists at Brown University: Guangbin Shi, Anyu Zhou, Cassady E. Rupert, and Kareen L.K. Coulombe demonstrated that the activated UPR downregulates all major cardiac ion currents and results in electrical remodeling in human induced pluripotent stem cell-derived cardiomyocytes (hiPSC-CMs). The research team focused in their studies on PERK and IRE1 branches that alter protein translation, mRNA decay and protein degradation. The authors observed that the activation of UPR induced an electrical remodeling similar to that observed in heart failure and significantly reduced all major cardiac ion channel currents that contribute to the action potential and current conduction. Specifically, they observed signiﬁcant concurrent reductions of mRNA and protein levels in specific cardiac ion channels (SCN5A-Nav1.5, CACNA1C-Cav1.2, KCND3Kv4.3, KCNH2-hERG, and KCNQ1-KvLQT1) in tunicamycin (TM) treated hiPSC-CMs. Furthermore, they found that GSK (a selective inhibitor for PERK phosphorylation) suppressed protein levels of p-PERK, p-eIF2α, and ATF4 and reduced TM-induced APD prolongation and prevented the TM-induced reduction of the maximal conduction velocity in hiPSC-CMs. Similarly, 4μ8C inhibited TM-induced activation of the IRE1 branch by inhibiting the gene expression of Grp78, decreasing the protein levels of pIRE1 and sXBP1, and shortening TM-induced APD prolongation in hiPSC-CMs. The study by Dr. Man Liu and colleagues’ provides compelling evidence that the activation of UPR specifically downregulates all major cardiac ion currents and results in electrical remodeling in hiPSC-CMs. They also discovered that activated PERK and IRE1 branches showed distinct patterns of downregulation of cardiac ion channels and the inhibition of either branch could partially reverse electrical remodeling in hiPSC-CMs. Activation of the UPR is likely to explain, in part, the arrhythmogenic remodeling in heart failure, and preventing the UPR may be a new approach for antiarrhythmic therapy by raising ion channel currents to pre-insult levels. Image credit: Liu M, Dudley SC Jr. 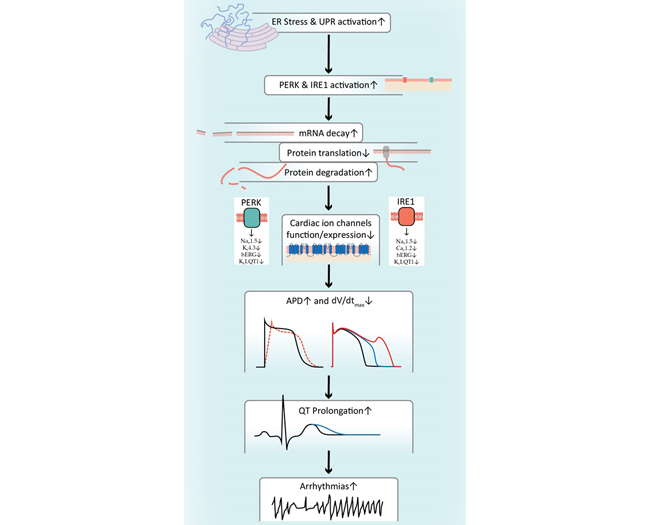 The role of the unfolded protein response in arrhythmias. Channels (Austin). 2018;12(1):335-345. doi: 10.1080/19336950.2018.1516985. Dr. Dudley is the Fred C. and Katherine B. Andersen Chair in Adult Cardiology, Professor and Chief of the Division of Cardiology, and Director of the Lillehei Heart Institute at the University of Minnesota. He is a Fellow of the American College of Cardiology and American Heart Association, Editorial Board member for the Journal of the American College of Cardiology, and a member of the Association of University Cardiologists and the American Society for Clinical Investigation. He is the founder of 3PrimeDx, a company making blood tests to predict arrhythmic risk and to determine the severity of diastolic dysfunction. His research program focuses on mechanisms and treatments of arrhythmia and diastolic heart failure. He has published more than 130 articles and chapters and has submitted more than 30 patent applications on new diagnostics and therapeutics in these areas. Dr. Liu is an assistant professor of the Division of Cardiology, the Lillehei Heart Institute at the University of Minnesota. Her research focuses on (1) the mechanisms of the UPR regulation on cardiac ion channels in heart failure and possible treatments by inhibiting the individal branches of the UPR in heart failure, and (2) Mg treatment in cardiac diastolic dysfunction. She has been working in these areas for a decade and published 20 peer-reviewed articles and book chapters. Liu M, Dudley SC Jr. The role of the unfolded protein response in arrhythmias. Channels (Austin). 2018;12(1):335-345. doi: 10.1080/19336950.2018.1516985.